A new source of energy, almost too good to be true, is on our horizon. It's called the LFTR (Liquid Fluoride Thorium Reactor), pronounced "lifter". A recent article in Wired magazine (The New Nuke, December 2009: http://bit.ly/4xEbSm) makes a case for this radical new form of energy. The author, Richard Martin, even claims that LFTR created electricity would be so cheap that it wouldn't even be metered -- it would be FREE! "The concept of nuclear power without waste or proliferation has obvious political appeal in the US, as well. The threat of climate change has created an urgent demand for carbon-free electricity, and the 52,000 tons of spent, toxic material that has piled up around the country makes traditional nuclear power less attractive. President Obama and his energy secretary, Steven Chu, have expressed general support for a nuclear renaissance. Utilities are investigating several next-gen alternatives, including scaled-down conventional plants and “pebble bed” reactors, in which the nuclear fuel is inserted into small graphite balls in a way that reduces the risk of meltdown. "Those technologies are still based on uranium, however, and will be beset by the same problems that have dogged the nuclear industry since the 1960s. It is only thorium, Sorensen and his band of revolutionaries argue, that can move the country toward a new era of safe, clean, affordable energy. Perhaps LFTR energy generation is too good to be true — almost everything that’s been hyped as ‘the future of…’ is, after all. But not everything — the exceptions to the ‘hype rule’ now dominate our modern technological society (home computers, mobile communications, satellite communications, etc.). So what if LFTRs are the real deal? Well, some very clever folks have been looking into this and conclude that it is — or at least worth pushing. Read the "Energy from Thorium" blog (http://bit.ly/19mp4k) for more details and plenty of pros & a few cons on the subject. 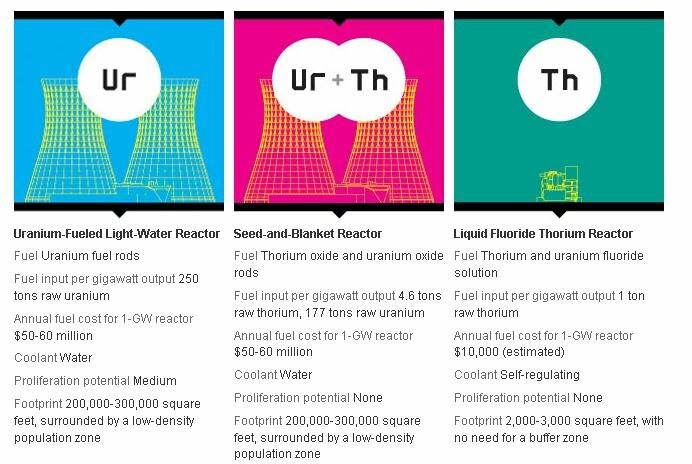 Easily available Thorium supplies, if used in LFTR, could power the world forever. 24×7 baseline power (unlike solar or wind). Can be built anywhere there is water. That means no new grid wiring (convert current coal-fired plants which all have a water source and connect to the grid). Electrical power developed is very inexpensive (some estimates are as low as ONE CENT/kWh to produce). Safe from melt down because if something goes wrong, the reactor naturally shuts down rather than blows up. And, of course, it emits no greenhouse gases. I encourage you all to study up on LFTRs, and if you agree this could solve our energy problems, contact your local representatives [ http://bit.ly/4yLnaI ]. Let’s face it – our country’s economy is in shambles. Our debt rises exponentially (a whopping $14 Trillion, over $35,000 per man, woman & child) while the government helplessly just throws money at it – money it doesn’t have. We can’t even afford to pay the interest on our national debt! First Paulson and now President Obama spend trillions (putting us more & more in debt) while no one proposes a really viable solution. We desperately need a solution to this horrific problem -- one that just might WORK. 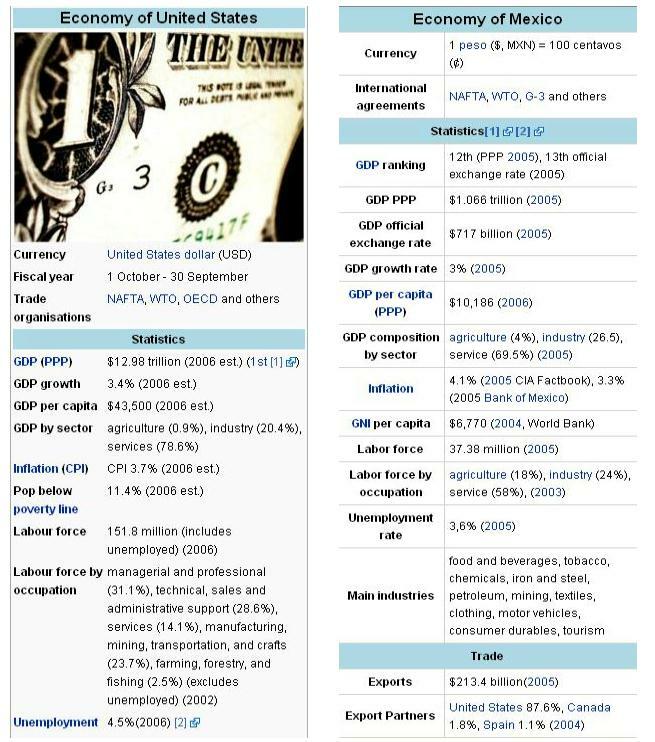 But first, let’s look at the facts. We're strictly a consumer society. All we can do anymore is consume -- we don't make anything (competively) anymore. The hope of selling our “superior” technology to the world hasn’t materialized. Other countries now have their own aerospace industries, biotech development, cars, electronic gadgets, medical care, movies, software, video games -- all equal to (and cheaper than) anything we can create. Instead of being a supplier to the world, the rest of the world builds everything for us, from cars to high tech. If we keep this up, they'll have all the money in the world, and we'll be left with rusting old junk that doesn't work anymore and horribly in debt. The worst part of it -- our children and grandchildren will bear the burden of this debt their whole lives because of our foolishness and shortsightedness -- we’re all doomed! But do we HAVE to be doomed? Isn’t there some way to avoid all this? What can we do? Well, think for a moment about something very precious that we do have, that we can sell to the rest of the world -- BEAUTIFUL LAND -- GREAT WEATHER -- LAW & ORDER and DEMOCRACY. There's all that Western USA government land, plus, if we buy it from Mexico and make it a state, we'd have the Baja peninsula -- a West Coast Florida, without the hurricanes, humidity and bugs. It’s essentially virgin territory, close to the rich US West coast cities, with convenient shipping lanes to and from Asia. One look at the map shows Baja is the West coast equivalent to Florida, and it has more in common -- geographically -- with the USA than Mexico. One transaction, like the Louisiana Purchase (in 1803 for $23M) or buying Alaska from Russia (in 1867 for $7M), would make both Mexico and the USA solvent in a few short years. In the '80s, I was alarmed at our $200 Billion deficit, our $3 Trillion debt, and our increasing trade imbalance. I thought -- what does the USA have that we can sell to the rest of the world, to reverse this disturbing trend. Our oil was running out, factories were shutting down, and imported goods were flooding our markets. Since we had hundreds of millions of acres (mostly in the West) to sell to people all over the world, with the draw of freedom, democracy, law & order and the safety of American citizenship, I thought overseas millionaires and billionaires would pay plenty for this most beautiful, pristine land. So, I snail-mailed every government official I could find an address for and tried to convince them to sell some of the hundreds of millions of acres of federally owned land to pay off the debt. Only two government officials even bothered to reply (out of many dozens who sent 'boilerplate' replies) -- they both told me that government isn't in the real estate business, end of discussion. Well, maybe our gov't isn't into real estate -- in normal times, but those weren't normal times, and today it's even worse. Nobody (except perhaps Ross Perot) saw the writing on the wall then and not many realize the true situation now. The Baja peninsula would make the perfect new real estate boom for the USA. Since Mexico has an $800B debt, and the US has a $10 T debt, all we have to do is buy Baja from Mexico, for, say, $1T, spread over 10 years, which would pay off Mexico's entire debt. Another $1T is nothing to the USA after all our other bailouts. Billionaires won't touch land in Baja until law and order is established there and it develops a modern infrastructure. After the USA buys Baja, it's officially made our 51st state, and the US military establishes law and order there (we'd also medicalize -- make them legal by prescription -- drugs to wipe out the drug cartels). Then, the newly established US Department of Baja Realty subdivides its 36 million acres into plots to sell to the highest bidders. Baja could be a “mainland Hawaii”, a brand new US state, a paradise on earth where everyone would dream of living, far from Dubai and Mideast turmoil. An immediate advantage -- the Herculean task of building the infrastructure for the 51st state will create full employment for the US (and previously illegal Mexican) workers for decades. President Obama has already proposed spending $1T on infrastructure. Let’s spend half of that money on Baja, half on the other 50 states. The fantastic Baja coastline will attract millionaires and billionaires from all over the world. Our government should net $20T+ over a couple of decades. The only problem is making enough potable water for the new state, which has the greatest weather (far fewer hurricanes than Florida, plus mountains and great fishing on both coasts) but no drinkable water. To alleviate this problem, giant desalination plants (like the Red Sea to Dead Sea project now planned) would be built up and down both Baja coasts. Revolutionary new methods of desalination are coming on line, particularly the new Rapid Spray Evaporation (RSE) method described here. The Baja boom will be the next "man on the moon" project to get the public excited again. We Americans seem to need these 'land booms' every so often. However, we need this program even more than going to the moon – our childrens' future depends on it. Then, after the debt is paid off, we insist congress passes an ironclad balanced budget amendment to the constitution so we never get into this mess again. Diplomats and politicians from all over the world have tried to achieve Mideast peace for over half a century, to no avail. Is such a peace even possible? What’s at the core of the problem? Is it land rights, religious bigotry, ignorant discrimination, revenge for past wars and incursions? Just what makes two semitic (once brothers) cultures so hateful towards each other? Is it too late to take an objective view of the situation and come up with some solution that would actually work, or are these two peoples doomed to live forever under the threat of attack and sudden death? Can’t SOMETHING be done? Well, maybe there IS a solution to this seemingly unsolvable problem. Consider the Northern Ireland war between Catholics and the English. What ended that century long war so that people there could again live in peace? Well, it wasn’t diplomats or politicians – it was the MOTHERS on each side, declaring that their sons and daughters would no longer kill each other. They marched and got together over tea in their kitchens and soon learned that their supposed enemies weren’t evil or war mongers, they were just like themselves – only they’d been whipped up by the militants among them to hate & kill the “enemy”. Miraculously, once a sufficient number of mothers got to know and understand each other, they ordered their children to lay down their guns and bombs and trust the other side and live normal, peaceful lives like the rest of the civilized world. This simple idea worked -- and it might also work in Israel and Palestine, too. Instead of mothers, I propose an extensive student exchange program -- exchanging thousands of teenagers between nations. Such programs have been done on a small scale, with some success, but never as an extensive, countrywide program. It would take thousands (perhaps tens of thousands) of each country’s best and brightest teenagers to pull this off. Such a huge plan as this can only happen through the auspices of the United Nations. Only the U.N. could properly organize, control and monitor such a large program. It could be a 21st Century “Peace Corps”, only this would be an exchange Peace Corps, not just teenagers repairing 3rd world infrastructure and agriculture – this would be teenagers building peaceful relations between warring countries. If either country refused to participate, it would be widely shunned as the war monger, and eventually forced to comply. Universally, youth are the hope of the future. I feel they are also the Mideast's ONLY hope for a peaceful future. To implement such a program, the U.N. would ask every high school in both countries to select their best students who would be willing to spend 6 months to a year in the dreaded enemy country. The teenagers must be thoughtful and intelligent (not problem children) young people – each one of them the pride of their respective school and family. They’d be linked to their counterpart teen in his country with his family, go to his school, discuss religion and politics with their hosts, conduct themselves honorably, and, hopefully, come home with an understanding of how the ‘enemy’ thinks -- plus defend his own country’s positions. It wouldn’t be easy, but these exchange teenagers duty is far more important than serving in the army. And...one of the primary reasons such a program would bring peace to the area...which country would lob missiles or bombs at the other, knowing that their OWN CHILDREN are down there, subject to DIE as a result of their violent acts? This would be the primary incentive NOT TO GO TO WAR -- their OWN kids are over there. Even if one country did do such a stupid act, can you imagine the groundswell of public opinion against their military or militants? Once this program is initiated, all fighting WILL STOP. When the teenagers return home, they’d tour their home country and be extensively interviewed on TV in both countries, discussing the differences and similarities between the two cultures and attitudes. Discussion groups would be encouraged throughout both countries. Such programs would be more popular than any reality show. There’s no shortage of peacemakers and peaceable people on both sides of this border. Peace loving people far outnumber the Hamas and radical zionists -- they're just not organized so they can make their voices heard. Goldie Meir once said, "When they love their children more than they hate us, then there will be peace". This hatred lives on both sides of the border, and is largely the result of ignorance and long festering revenge that must be overcome. No one is without blame, no one is perfect, but no one wants all-out war, and no one wants to have their country destroyed. Every reasonable, thinking person -- on both sides -- wants peace. We just need a plan. Have you heard of any other feasible plans? How to Fix Our Broken K-12 Educational System - Recruit Our Top Teachers and Produce EXCITING World-Class Lessons on DVD -- "Classroom Spectaculars"
Ask any student how many teachers were exciting, inspiring, and turned them on to a lifetime of self education? Chances are, if they’re honest, they’ll say they’ve never really had such a teacher, or maybe one, if they were extremely lucky. That’s the problem with K-12 education – there are hundreds of world class, fascinating, teachers out there, but the vast majority -- millions -- of students are rarely exposed to them. Wouldn’t it be wonderful if, somehow, there were a way to bring together the few fantastic, exciting, fun teachers we're fortunate to have with the millions of students across the country needing them, in every subject and grade? Wouldn’t it be even more wonderful if, somehow, these terrific teachers could be combined with stunning video graphics and sound, like the video games our kids play an average of four hours per day? The old teaching method of sitting quietly in a classroom, listening to a teacher talk, just doesn’t work anymore. Amazingly, teaching methods haven’t changed since our great-grandparents went to school a century ago. While our kids have advanced, the teaching establishment has not. Thanks to TV, video games, iPods, cell phones, texting on Blackberries, our kids have developed much quicker responses and much lower boredom thresholds. Something must be done to alleviate this generational discrepancy. Can you imagine any possible way we could, using 21st century technology, give all students a world-class education? 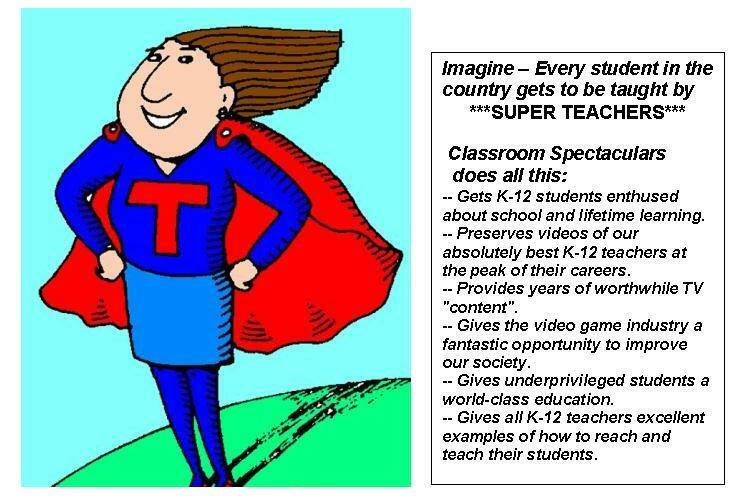 Classroom Spectaculars (CS) is the name I've given to a revolutionary new concept in K-12 education. The Problem: Today's K-12 students are thoroughly bored in class, thanks to daily exposure to the vivid action and sensational sound of today's video games & TV shows. This boredom leads to undisciplined classes that distract teachers from their teaching duties. This in turn makes it impossible to students to learn what they need to know to become useful citizens and succeed in life. CS will start as an ingenious new reality TV show, selecting the absolute best K-12 teachers (for every grade and every subject) in the USA. First, schools all across the country will submit one-hour videos of their favorite teachers to begin the search. Next, these videos will be reviewed by panels made up of educators and entertainers, selecting the top (most dynamic) 10 teacher candidates for each class grade and subject (about 150 categories total for the 13 years). Next, the top teachers will compete in a network "reality" TV show (similar to American Idol, The Apprentice and Last Comic Standing) to select the absolute best teacher for each subject and class level (category). The winning teachers will have that special presence and excitement that our students need to really "get into" and learn a given subject. The TV shows will provide roughly 150 half-hour "shows" of new educational entertainment content for the TV networks (who'll gladly foot all the production costs). CS will make a reality show like never before, since competing teachers would have many more local supporters, offer VERY interesting content (since they LOVE to teach and LOVE their subjects) with an enthusiasm you'd never see in an ordinary singer, dancer or apprentice wanna-be. Then, the winning teachers (one for every grade & every subject) will be professionally video recorded in their actual home classrooms for one entire school year. These videos will form the basis for sensational productions, living up to the name, “Classroom Spectaculars”. Next, professional video game creators, along with graphic artists, sound and special effect creators will turn the in-class video recordings into 30 minute (per class period) DVDs, full of vibrant sound and sweeping video graphics, that teachers across the land will use to teach their classes. An accreditation panel (made from top accreditation boards across the country) will guarantee the DVDs cover ALL material required to the depth required for the best possible education. When completed, the program material will cover all subjects for all thirteen class years. CS will provide a fully accredited K-12 education online or plastic (DVD disks), as well as preserving forever the very best teachers at the peak of their teaching careers. Since the winning “star” teachers are the best of the best, they are most capable of capturing the interest of even the least motivated student. These excellent teachers are fired up to get their subjects across to the viewers, since they completely know and love their subjects, having taught them for years! The result will be a fantastic, mind-blowing library of “edu-tainment” DVDs. These (Blu-Ray or HD) high density DVDs (capable of nearly a hundred hours each) will be made available for use in K-12 classrooms throughout the country and perhaps, eventually, the entire world, educating children like never before, in every subject. Our kids will finally be learning and loving it, and the teachers will become world-class celebrities! Imagine...celebrities famous for their knowledge and spectacular teaching skills rather than their good looks or acting talent. The half-hour videos, one for each class period, will give the home classroom teacher equal time per hour to introduce, pause the show, elicit classroom comment and answer questions. The videos won’t be a "threat" to the home teachers; rather, CS will relieve them of having to insure required material is presented, as well as relieving them of having to prepare their daily lessons. Instead of a threat to the home teachers, CS will serve as excellent examples of the very best possible teaching techniques and material, in their own subject and grade. CS should help tremendously to alleviate the ever-worsening K-12 teacher shortage. In-class teachers will be inspired by the excellent teaching examples and by the possibility of someday becoming celebrity teachers themselves. The cost of implementing such a system will be negligible, since the TV studios will be paying all production costs, and distribution costs will be minimal compared to the billions currently thrown at our declining educational system today, with poor effect. CS videos will be universally available for take-home use (repetitive viewing is crucial) and for family entertainment. CS will bring top quality education to the poorest urban ghetto schools and the tiniest country schools all over the country. They will be made available to prison inmates to view (and finally get a quality education) rather than watching ordinary TV or video games. The videos are a natural for the internet and will also be shown on dedicated CS TV channels as "edu-tainment", similar to Nova, Cosmos, Discovery & the History Channel (but much more exciting to watch). Q - How much will it cost? A - This is the best part – CS will essentially be free to put into all our K-12 schools! The TV networks will pay for the reality show competitions, just to get the many years of popular entertainment TV ‘content’. Since no celebrities are involved, and the teachers will be happy to participate for free, the only costs will be for the graphic artists, sound and special effect creators, who might be willing to contribute their talents for the good of the educational system. Even if they charge for their work, those charges could easily be paid out of the TV network profits. Using new high density DVDs (and perhaps 'Colossal' 100 TeraByte DVDs someday) makes the number of actual disks to distribute minimal. Perhaps the government or DOE will foot the production and distribution bill. Either way, it will cost much less than the billions thrown at our K-12 system today, with very little effect. Q – Why did I patent Classroom Spectaculars? A – Not to make money, just to keep my hand in, and make sure CS turns into the great venture I predict it will someday. Q – What sort of time schedule will CS take? A – This is undetermined now, but for talking purposes I suggest doing only one or two grade levels per year, starting with Kindergarten. That way, the kids in the first class will proceed at (or nearly at) the rate of CS development. They’ll be the best educated children this country has ever seen. Q – Doesn't CS undermine local (in-class) live teachers? A – No. K-12 classes will still need live teachers, to show the CS videos and conduct Q&A sessions in the 2nd half-hour. CS also gives local teachers first-hand examples of how to become excellent teachers themselves. Above all, teachers want order restored to their classes, and they want students to learn. Teachers won't have to spend so much time preparing lessons or making sure accredited material is presented -- that'll automatically be done for them, so they can spend their time answering questions and conducting review sessions at the end of the video. Home schoolers will love CS. Q – What do the NEA (Nat'l Educ. Assoc.) and AFT (American Federation of Teachers) think of CS? Don't they view it as an assault on the teaching profession? A – See answer above. The teacher's unions know K-12 education has serious problems, as stated above -- discipline, poor teachers, high dropout rates, uneducated graduates, all problems that CS will alleviate if not completely eliminate. It's only a matter of time before the NEA and all teachers realize the obvious advantages and inevitability of CS. Produce a crop of high school grads that will revolutionize the world. CS would make it possible for us to have the best K-12 schools, too. I maintain that the same sort of DNA irregularities might possibly point out a newborn human’s inclination towards violence or mental deficiency that might result in future violent behavior. If this turns out to be true, as it seems likely, a DNA test on every human at birth might provide a way to avoid their ever causing harm to others in their lifetime. Once a baby is found to definitely have these violent tendencies, they could be given therapy, medication or whatever treatment available to free them from a miserable life or crime and disaster. Perhaps it might even be possible to “repair’ their DNA to make them useful members of society, and give them a normal, happy life. How else are we to minimize, or even eliminate, crime? Although it seems inhumane to sort people at birth based on their DNA, some futurists are suggesting just that. If an exhaustive study could be conducted of all criminals and a similar large group of non-criminals, using their DNA data and other vital signs, building a giant data base similar to the Human Genome Project begun in 1988, and letting the computers crunch this data...perhaps, just perhaps…a pattern could be found. This pattern, if it exists, would be a major breakthrough for the human race. If it could pull needles out of the giant haystack, and point out how certain people, unknown and uncontrollable to/by them, have the beginnings of criminal tendencies. This could be a great leap forward for the entire society, good and bad alike, providing criminally inclined people to be identified, treated and isolated before they cause danger to others and themselves. Just think of the impact such testing could have on society. This could be the beginning of a world without crime or violence – no more police stand-offs with insane people with guns – no more movie theater massacres – no more ISIS terrorists (assuming you could test entire world). Basically, if we can find DNA clues to intelligence, we can find DNA clues to violence and insanity and remove it from the ‘human condition”. This could revolutionize society and make the world a far safer place! "Every week, I wait for the cold steel bars to close behind me, for count to be called, and for men who have years – maybe the rest of their lives – to spend in this prison to come talk with me. I am a clinical psychologist who studies chronic antisocial behavior. My staff and I converted an office in a Connecticut state prison into research space that allows us to measure neural and behavioral responses. Recently, Joe, a man serving a life sentence, came into our prison lab. Before I could even review our research consent form, he said, “You know it is all about the brain.” Joe asked if we could provide evidence that “something” in his brain was responsible for his crime. If not, could we just “zap” his brain to remove bad “stuff,” like on TV?"